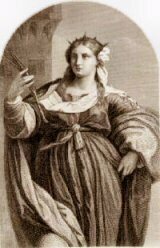 December 4 was the universal feast of St. Barbara, until the revision of the General Roman Calendar. She was a saint that presented historical difficulties. Her feast is still December 4, but only celebrated locally in various areas. Her cult has much popularity, as she was also one of the "Fourteen Holy Helpers." Here are some ideas on celebrating her feast. Germanic countries in particular have a great devotion to St. Barbara. She was one of the Fourteen Holy Helpers (Fourteen Auxiliary Saints). Each saint has a separate feast or memorial day, but the group was collectively venerated on August 8. They are grouped together because of the Black Plague which devastated Europe from 1346 to 1349. The people turned to Heaven, begging the intervention of the saints, praying to be spared or cured, or to at least die a good death. St. Barbara's Branch German-speaking countries celebrate the tradition of Barbarazweig, or the St. Barbara's branch. The original folklore was that unmarried girls cut twigs from cherry trees and forced them into bloom. There is an old belief that if the twig blossoms on Christmas Eve, the girl will be married the following year. The practice of forcing the blooms on the cherry tree twigs comes from a legend that while St. Barbara was locked in her tower, she felt lonely. She found a dried up cherry tree branch which she watered daily with a few drops from her drinking water. She was greatly consoled by the beautiful cherry blossoms that appeared just days before her impending execution. This would be a nice decoration for the home during the winter season. Branches from other flowering plants or trees may be used: apple, forsythia, plum, lilac, chestnut, jasmine or similar blossoms, but cherry is the preferred. If outdoor temperatures have been around 32° to 40° F for about six weeks, the buds are ready for forcing. On a day with mild temperatures, pick branches that have swollen buds and cut stems. Crush the ends of the branches, and submerge in a tub of cool, not icy, water for several hours. Place the branches in a large vase of water. For a few days, leave the branches in a cool area. As the buds begin to swell bring the branches into a warm room, but not in direct heat. Spritz with lukewarm water periodically, and when the blooms appear, place the branches in a sunny window. Change water every two days. Thin branches force more quickly than thick ones; the blooms should appear anywhere from one to five weeks later. Have each member of the family cut a branch, and it is said the person whose branch has the most blossoms on Christmas is supposed to be Mary's favorite. Whatever the case, the blossoms will make a nice decoration for Christmas. Breads and Foods St. Barbara's feast day has traditional breads and other wheat foods symbolizing the harvest, with overtones of death and rebirth, tying her feast day to Christmas. In France and the Ukraine, two or more grains of wheat are planted and forced to grow. Folklore states that if they flourish by Christmas Eve, the wheat crop will prosper that year.